The starting point for the dangerous game species in Africa, this is the most classic safari round in the modern era. 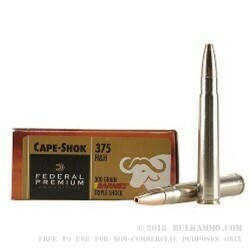 It is a powerful, high quality 357 H&H round that offers excellent ballistics and can kill essentially any animal on the planet, though it’s best suited for particularly large and dangerous animals due to the devastating ballistic performance and the hard-hitting massive projectiles. There’s a lot to this caliber and this load is a very innovative take on the classic round. It features a Barnes all-copper projectile with a considerably high weight retention ratio and a monolithic design that offers extreme penetration through thick hides and tough bone and muscle of the largest game in the world. The astonishingly high energy of the round shows that delivery of energy is the main point to the round. The projectile, a massive 300 grains is pushed out of the bore at 2470 feet per second, and the energy at the muzzle is an incredible 4064 pound feet. 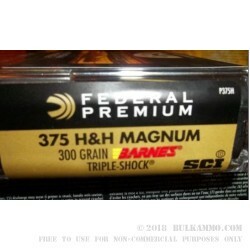 For animals that need to be dropped quickly to preserve the safety of hunters or others, the .375 H&H Magnum is a superior round for the relative weight and size compared to many rounds in the belted magnum arena. This is a legacy round that will probably be around forever because of its proven capabilities and the other great characteristics it has.